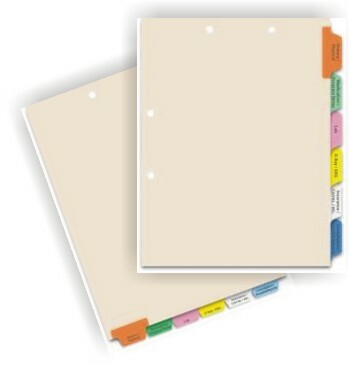 Custom dividers are a cost effective way to organize and they make finding information easy & fast. Lancer Ltd. has a variety of dividers and file backs that can be customized to fit your filing needs. We can either match your existing chart dividers or custom design to your EXACT specifications. The film laminated over the entire tab is remarkably strong and will withstand hard, continuous usage without tearing, splitting or peeling. The tabs come in a rainbow of colors and may be be printed, numbered, or blank. A variety of paper stocks and tab lengths can also be tailored to your requirements, with 3 to 11 tabs per bank. We can also fuse a narrow strip of reinforcing along the binding edge to prevent pull-through at the binder holes. Lancer Ltd.'s filebacks allow you, the user, to add or remove select pages without disturbing the existing documents within the folder. Filebacks are especially useful to those in the medical field, financial and banking services and law or accounting, where multiple files might need to be stored together in one folder. Each fileback is manufactured with either clear or color reinforced index tabs which are custom printed in black ink to meet your specific needs. We add clear reinforcement over the slots or holes for durability. 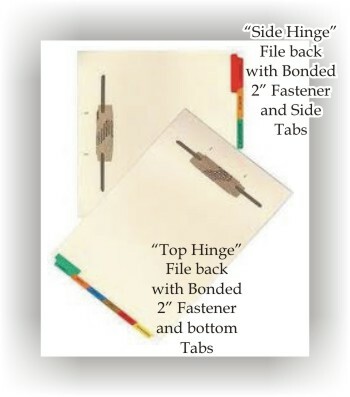 Standard transfer tape filebacks have a self-adhesive strip and two 2" bonded fasteners that can be added easily to any chart or folder on the front or back. This is a great product for busy offices! 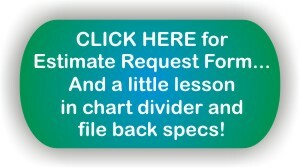 Click on the Button Below for quotes on Chart Dividers or File Backs! Remember to order your file folders, labels and vinyl outguides...you'll find all your filing needs right here at www.lancerltd.com!